Ras Al Khaimah, United Arab Emirates, July 16, 2015	(Newswire.com) - Grace Century (www.gracecentury.com), the UAE-based private equity consultancy, has been hand-picked as one of only three technology-focused companies to present to an exclusive group of high net-worth individuals in Singapore on July 30th 2015. Grace Century specialize in identifying game-changing developments in healthcare technology, and are currently partnering with Provia Laboratories who have developed pioneering dental stem-cell storage systems, and The Quantum group who have developed an intelligent healthcare technology platform host electronic medical records. Grace Century’s project partners have demonstrated impressive results so far in 2015, with Provia Laboratories posting a 47% increase in enrollments year to date and having their first patent approved. Millionaire Asia organizes many private events that are exclusively by invitation only. The Millionaire’s Summit, our signature event, has been held over 43 times across 9 countries in the region. An investments and wealth management seminar for HNWIs, has become one of the highly-anticipated networking events of the year. Another signature event is the MillionaireAsia Private Aviation & Luxury Lifestyle Show, which has garnered the attention of local and overseas ultra-high net worth individuals. Held once a year in Singapore, the overwhelming success of the show saw the inaugural Private Jet Party take place at Subang SkyPark in Kuala Lumpur, in 2011. This signature event has become a much-anticipated aviation and luxury lifestyle showcase held once in March in Singapore and in October in Malaysia. From a single edition launched in April 2005, MillionaireAsia has launched a total of 9 distinct editions, -- Singapore, India, Indonesia, Malaysia, Vietnam, Macau & Hong Kong, Japan and Taiwan, reaching a readership of 300,000 high net worth readers. MillionaireAsia is trademarked in 24 territories including Singapore, Malaysia, Indonesia, Thailand, Philippines, Vietnam, Hong Kong, Macau, Taiwan, China, Korea, Japan, Australia, New Zealand, India, UAE, South Africa, Russia, UK, USA, Argentina, Chile, Cambodia and most recently Myanmar. 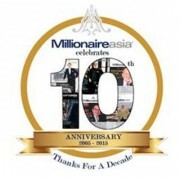 Significantly, MillionaireAsia owns the largest database of millionaires in Asia. MillionaireAsia's 130,000 database continues to grow with each new territory it enters, targeting the richest 1 to 2% of the wealthiest in each country.